A. Army Officers who have retired between 01 / 01 /2016, and 04/09/2017 i.e. date of issue of orders for revised pension based on the recommendations of the 7th CPC shall have two options (i) an option in relaxation of “provisions of relevant Pension Regulations, not to commute the pension which has become additionally commutable on retrospective revision of pay/ pension on implementation of recommendations of the 7th CPC i.e. OR (ii) Commute. 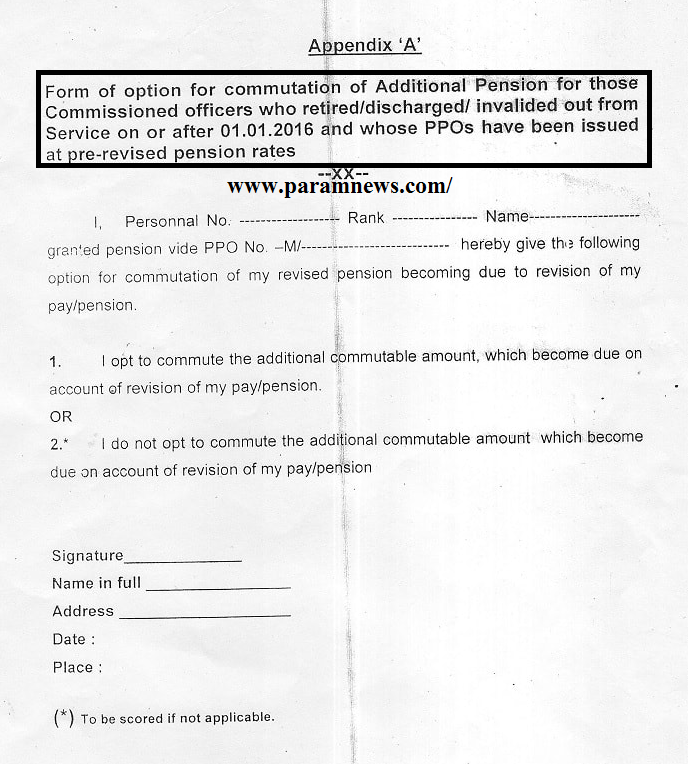 additional commutable amount, which becomes due on account of ‘revision of Pay/ Pension. Retired Army officers can opt for one of these two options. Option form is enclosed as Appendix to be used for this purpose. B. Hard copy of Option for commutation of additionally commutable amount duly signed by the officer will be required to be submitted within 4 months i.e. by 03/01/2018 from the, issue of the Gol, MoD letter No. 17(02)/2016-D(Pen/Pol) dated 04/09/2017, by the Armed Forces officers. Option exercised after expiry of 4 months from the issue of the Govt, letter will not be entertained. The claim submitted without exercising said option or if no option is received for commutation of additionally commutable amount of pension within stipulated time period as , A mentioned above, it will be presumed that pensioner is not willing to commute additionally commutable amount. I, Personnel No.________ Rank ________ Name ____________ granted pension vide PPO No. ___M/ _________ hereby give the following option for commutation of my revised pension becoming due to revision of my pay/pension. 1. I opt to commute the additional commutable amount, which become due on account of revision of my pay/pension. 2. * I do not opt to commute the additional commutable amount which become due on account of revision of my pay/pension. (*) To be scored if not applicable.